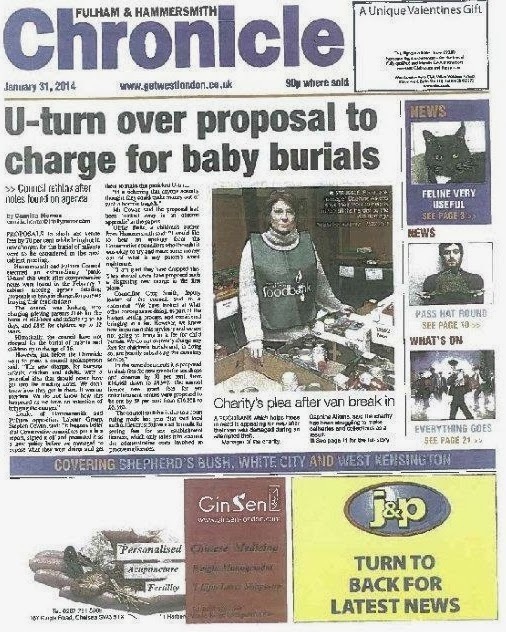 On Monday night, H&F Conservatives had been planning to vote through a brand new charge of up to £1,692.00 targetted at grieving parents who wanted to bury their deceased child. But a combination of the ever-diligent work of Cllr. PJ Murphy (Lab) and the excellent journalism of Camilla Horrox of the Fulham and Hammersmith Chronicle caused them to suffer 24 hours of panic before they decided to back down and drop the sickening new stealth tax just before the newspaper went to press. The Borough's leading Conservative councillors signed off their new charge plan which is how it got included in the budget plan. They then instructed officials to include the new charges in the 3rd February Borough cabinet report which was published two weeks ago. In the report they recommend that these “fees and charges are approved”. So it was all set to be voted through on the nod - just like all the other reccomendations the Borough's Conservative leadership has signed off over the last eight years. H&F Conservatives initially tried to pass this insensitive new stealth tax off as bringing Hammersmith and Fulham Council in line with what some “other councils do.” But it quickly became evident that this was going to be a front page local news story which was also likely to picked up by regional and national media and last week H&F Conservatives performed a panicked u-turn desperately trying to limit the damage to their reputations spinning that this was all a terrible “mistake” - a line that is evidently not true. I am glad that we managed to stop this awful new charge before it was formally enacted. Once or twice in the past, when the only harm would be to local Conservative councillors’ reputations, we have let them go ahead and mess up - as they did when they voted to give themselves 18% salary rises. Similarly, back then, they had tried to say that was about bringing them in line with other councils but after three months drubbing in the press they dropped their new pay hikes and tried to tell an unbelieving public that it too was a “clerical mistake”. There is something deeply troubling about the judgement and values of anyone who thought they could make a few quid out of what is easily any parent’s worst nightmare. Apart from the tastlessness of trying to profit from grief there is the other question as to why anyone thought this was necessary? The Conservative administration waste vast amounts of money: such as giving away hundreds of millions of pounds in public land at knock down prices to property developers; or spending a staggering £5m a year on propaganda with vanity-banners, featuring pictures of Conservative councillors, hanging from the Borough's lamp posts. Sickening and terrifying that anyone could conceive of a tax like this. I feel as if we are being governed by psychopaths as they seem to be devoid of empathy. Out in May I say!